Three-panel figure shows diabatic minus frictional heating Q1- Qf (top), latent heating Q2 (middle), and Q1-Qf-Q2 (bottom) which is roughly equivalent to divergence of vertically integrated total energy transport, . The fields represent an annual mean in W m-2 for the period 1979-2001 at T31 spectral truncation. Further details are provided below. GOES-11 image of a portion of the Intertropical Convergence Zone (ITCZ) in the eastern Pacific Ocean	and the upward branch of the Hadley Circulation, a region of intense latent heating (see Q2 in the second panel in the figure immediately above). Image courtesy of GOES Project Science Office. We report here a newly completed (March 2003) recomputation and updating of vertically integrated monthly mean mass, moisture, heat, and energy budget products derived from the NCEP/NCAR reanalysis. This new archive spans January 1979 to December 2001 (23 years), and incorporates TOVS (TIROS Operational Vertical Sounder) reruns in addition to grid corrections implemented by NCEP for reanalysis data covering the period March 1997 through October 2001. Our monthly mean budget products are derived from 6-hourly model ( ) level data which the Data Support Section (DSS) at NCAR makes available in the form of `grbsanl' grib files on the MSS. The DSS web page ` ds090.0 HOME PAGE: NCEP/NCAR Global Reanalysis Products, 6-hrly, monthly ' provides extensive documentation and useful background. For an overview of the NCEP/NCAR reanalysis project see Kalnay and others, 1996. We note that the spectral truncation of the fields in the grbsanl files is T62 on a 192x94 grid (longitude by latitude), which we subsequently regrid to 192x96 with T63 truncation, the resolution at which we carry out all our budget computations. However, spatial spectra (power as a function of total wavenumber n) shows that in certain derived fields a considerable amount of extraneous power may exist beyond n=42 or so, and thus the final spectral truncation of our products is T42 on a 128 x 64 Gaussian grid ¹. We make a total of 36 budget products available in both netCDF and Fortran direct access binary files via email requests (see the section Accessing the Data). The description of these products and their derivation is outlined in the following sections, in which product names are highlighted in capital red letters in the tables and text of each section (see especially entries under `Product Name' in tables). The reader is referred to Trenberth (1991, 1997) for derivations and details of the budget equations we employ. We employ the following constants, consistent with those used in the NCAR Community Climate Model 2, i.e. CCM2 (see Hack and others, 1993), and later generations of the CCM (and CCSM). In model level (i.e. ) coordinates we utilize u, v, T, and q at 6-hourly temporal resolution on 28 levels. (The levels are 0.0027, 0.0101, 0.0183, 0.0288, 0.0418, 0.0580, 0.0782, 0.1028, 0.1326, 0.1682, 0.2101, 0.2582, 0.3125, 0.3720, 0.4357, 0.5017, 0.5681, 0.6329, 0.6943, 0.7508, 0.8014, 0.8458, 0.8838, 0.9159, 0.9425, 0.9644, 0.9821, and 0.9950, where pressure in the vertical is given by pi = iPs.) In addition, we employ the surface fields Ps and s at 6-hourly temporal resolution. Fields not available in coordinates in the NCEP reanalysis which must be derived at 6-hourly resolution and for all levels in the vertical include the kinetic energy, K = (u2+v2)/2, and the geopotential height, z = s /g + (Rd /g) H Tv, where H is the CCM hydrostatic matrix, and Tv the virtual temperature which is computed as Tv = T(1 + q). The hydrostatic matrix H is a function of the surface pressure Ps (see Hack and others, 1993, p. 27, for details, and our subroutine ccm2_hydrostatic_matrix). In addition, we compute the products uT, vT, uz, vz, uq, vq, uK, and vK, at 6-hourly temporal resolution for all levels. We compute monthly means of the basic and derived variables from the 6-hourly data. The monthly mean spans 00Z of the first day of a month to 18Z of the last day of a month, and incorporates a 29th day in February of the leap years 1980, 1984, 1988, 1992, 1996, and 2000. From this first batch of monthly means it is the monthly mean surface pressure s that we make available as a budget product. We define the vertical integral of a monthly mean field as a mass-weighted sum corresponding to ( )dp/ g where ( ) in the vertical integral is the monthly mean operator, and s the monthly mean surface pressure. We note that monthly means are computed before any vertical integration is performed. Trenberth and others (2002) discuss differences that arise (up to order ±10 W m-2) in the divergence of total energy ( ) if the vertical integral is performed at 6-hourly resolution, then the monthly mean taken, in the ERA-15 eta ( ) archive for January of 1989. In practice, the integral is obtained by computing pi = i s at the model layer interfaces given by i = 0.0000, 0.0066, 0.0139, 0.0231, 0.0347, 0.0492, 0.0672, 0.0894, 0.1165, 0.1492, 0.1878, 0.2329, 0.2842, 0.3414, 0.4033, 0.4686, 0.5353, 0.6013, 0.6648, 0.7240, 0.7777, 0.8253, 0.8664, 0.9013, 0.9305, 0.9546, 0.9742, 0.9900, and 1.0000, where = 0.0000 is the top of the atmosphere, and = 1.0000 is the surface of the Earth. (In the -coordinate such as for ERA-15, pi = ai + bi s for ai and bi at model layer interfaces.) Then, dp for a given layer is computed as the difference between the pressure of the lower interface bounding the model layer, and the pressure of the upper interface bounding the model layer. Since the units of dp/g, Pa/(m s-2), reduce to kg m-2, the term 'mass weighted' is used in association with the vertical integral. We also note that the flux quantities appearing in the following table are not mass-corrected. The mass correction and mass corrected fluxes are described in subsequent sections (see Mass Correction and Mass Corrected Vertically Integrated Monthly Mean Fluxes). Ã00Z, fdfm = A00Z, fdfmdp/g. Ãeom = ½(Ã18Z, ldgm + Ã00Z, fdfm). where ð/ðt is the time derivative operator, N the number of days in a month, and 86400 the number of seconds in a day. where is the divergence operator. To convert a variable with units kg m-2 s-1 to mm day-1 multiply by (103mm m-1 x 86400 s day-1) and divide by H2O. Similarly, to convert a variable with units mm day-1 to W m-2 multiply by ( H2O x L) and divide by (103mm m-1 x 86400 s day-1). (uc, vc) = / ( s - g (q)dp/ g - t). In practice, the mass correction is applied to the vertically integrated monthly mean flux quantities, as described in the next section. We note that Cp(UT,VT), g(UZ,VZ), L(UQ,VQ), and (UK,VK) all have units of J m-1 s-1. Taking the horizontal divergence, , of any of these, or any sum of these, gives rise to divergences of energy with units W m-2. where is longitude, latitude, and a the radius of the Earth. The units of PAET are W which we normally convert to PW (i.e. 1015W) by dividing PAET by (1015W PW-1). Note that at present we do not include PAET as a budget product for this particular archive. where LEP = Q2, the latent heating. In general, the estimated frictional heating Qf is less than a few W m-2 on an annual mean basis (see Peixoto and Oort, 1992, p. 383) and can be safely disregarded compared to the diabatic heating Q1. Thus, Q1-Qf Q1. TE = (g / PS) [ CpT + gZ + LPW + KE ]. NET = ASR - OLR. An annual mean net upward surface flux Fs for the ERBE period is shown below. 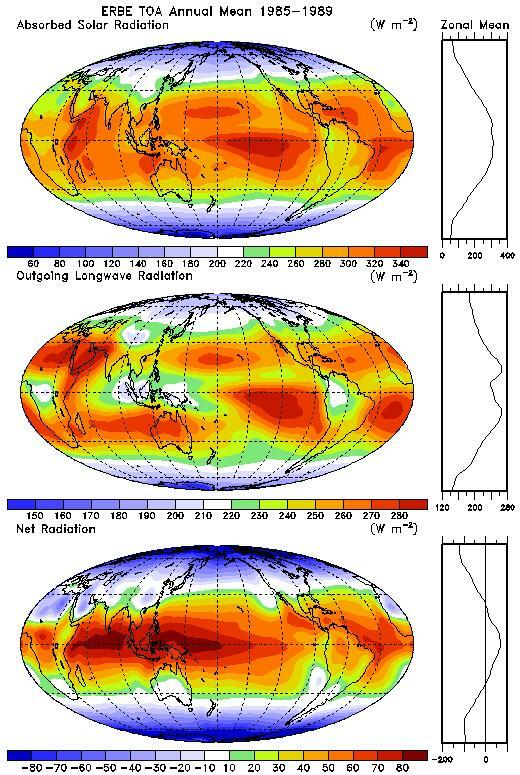 Three-panel figure shows TOA annual mean absorbed solar (shortwave) radiation AT (top), outgoing longwave radiation OT (middle), and net radiation RT (bottom) which is given by RT = AT - OT. The units in all three panels is W m-2 at T31 spectral truncation. The annual mean is in fact an annualized mean over the ERBE period February 1985  April 1989.
for the ERBE period radiation products and net upward surface flux. The size of a file is 9043968 bytes (.Fda) to roughly 9047300 bytes (.nc) each  for AT, OT, RT, and Fs, the size of a file is 1671168 bytes (.Fda) to roughly 1673300 bytes (.nc) each. The files may be obtained via email requests. The metadata of the netCDF files may be viewed with ncdump, for example, ncdump -h T42t_TEDIV_1979-2001_MM.nc. The coordinate variables (time, lat, lon) and the coordinate variable values are listed for convenience on a separate web page. A short Fortran program, `READ_FDA', for reading the Fortran direct access (.Fda) version of the files may be viewed separately. Or, simply download PROG_READ_FDA.f90 using your browser. We also make available a Fortran 90 subroutine, ccm2_hydrostatic_matrix, for computing the hydrostatic matrix H (see the section Derived Fields at 6-hourly Resolution above). For convenience we include an ocean depth and land elevation data set at 128x64 (i.e. `T42 Gaussian') resolution with longitudes and latitudes identical to those in the netCDF and Fortran direct access budget product files. For more information, see T42b_ELEVATION.nc and T42b_ELEVATION.Fda, which are now available via request only. We routinely use this ocean depth and land elevation data file as a land-sea mask, where ELEVATION < 0 represents oceans and seas, and ELEVATION 0 represents land. Sea ice is not represented in this data set. An image of the 128x64 ocean depth and land elevation data set is provided. (This link also includes further details about the construction of the data set). As a summary we reassemble all 36 budget product descriptions in the following table (refer to the previous sections for more specific details). ² In the netCDF files, the term `transport' rather than `flux' is used in the long_name attribute of the variables UT, VT, UZ, VZ, UQ, VQ, UK, and VK. Hack, J. J., B. A. Boville, B. P. Briegleb, J. T. Kiehl, P. J. Rasch, and D. L. Williamson, 1993: Description of the NCAR Community Climate Model (CCM2). NCAR Technical Note NCAR/TN-382+STR, 108 pp. Kalnay, E., M. Kanamitsu, R. Kistler, W. Collins, D. Deaven, L. Gandin, M. Iredell, S. Saha, G. White, J. Woollen, Y. Zhu, M. Chelliah, W. Ebisuzaki, W.Higgins, J. Janowiak, K. C. Mo, C. Ropelewski, J. Wang, A. Leetmaa, R. Reynolds, R. Jenne, and D. Joseph, 1996: The NCEP/NCAR 40-Year Reanalysis Project. Bull. Amer. Meteor. Soc., 77, 437-471. Piexoto, J. P., and A. H. Oort, 1992: Physics of Climate. New York, American Institute of Physics, 520 pp. Sardeshmukh, P. D. and B. J. Hoskins, 1984: Spatial smoothing on the sphere. Month. Wea. Rev., 112, 2524 -2529. Trenberth, K. E., 1991: Climate diagnostics from global analyses: conservation of mass in ECMWF analyses. J. Climate, 4, 707-722. Trenberth, K. E., 1997: Using atmospheric budgets as a constraint on surface fluxes. J. Climate, 10, 2796-2809. Trenberth, K. E., D. P. Stepaniak, and J. M. Caron, 2002: Accuracy of atmospheric energy budgets. J. Climate, 15, 3343-3360. The majority of the references listed here are Climate Analysis Section publications based solely or in part on atmospheric mass, moisture, heat and energy budget products derived from reanalyses  the NCEP/NCAR reanalysis to a larger degree, and ERA-15 (and ECMWF operational global analyses) to a lesser degree³. Other publications are listed for technical reference and further background. Trenberth, K. E., and D. P. Stepaniak, 2004: Inferred annual cycle of equivalent ocean heat content. Geophys. Res. Lett., submitted. Trenberth, K. E., D. P. Stepaniak, and L. Smith, 2004: Interannual variability of the mass of the atmosphere. J. Climate, submitted³. Trenberth, K. E., and L. Smith, 2004: The mass of the atmosphere  A constraint on global analyses. J. Climate, submitted³. 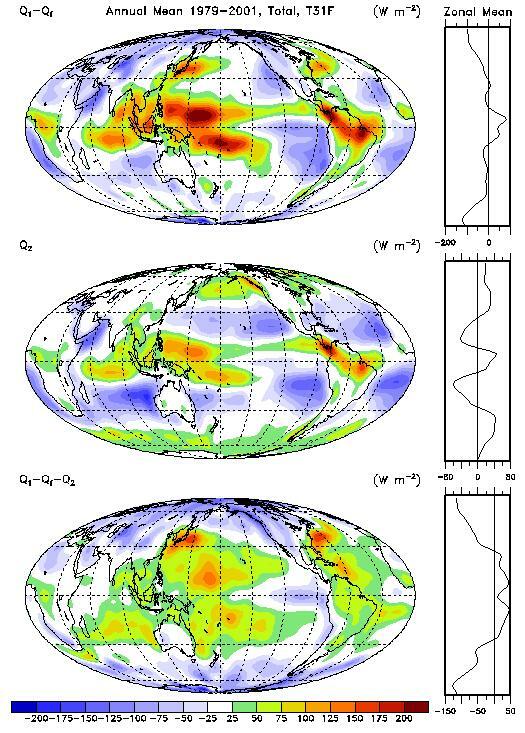 Trenberth, K. E., and D. P. Stepaniak, 2003: Seamless poleward atmospheric energy transports and implications for the Hadley Circulation. J. Climate, 16, 3705-3721. Trenberth, K. E., and D. P. Stepaniak, 2003: Co-variability of components of poleward atmospheric energy transports on seasonal and interannual timescales. J. Climate, 16, 3690-3704. Trenberth, K. E., D. P. Stepaniak, and J. M. Caron, 2002: Interannual variations in the atmospheric heat budget. J. Geophys. Res., 107, D8, 10.1029/2000JD000297. Trenberth, K. E., J. M. Caron, D. P. Stepaniak, and S. Worley, 2002: The evolution of ENSO and global atmospheric temperatures. J. Geophys. Res., 107, D8, 10.1029/2000JD000298. Trenberth, K. E., and D. P. Stepaniak, 2002: A pathological problem with NCEP reanalyses in the stratosphere. J. Climate, 15, 690-695. Trenberth, K. E., and J. M. Caron, 2001: Estimates of meridional atmosphere and ocean heat transports. J. Climate, 14, 3433-3443. Trenberth, K. E., J. M. Caron, and D. P. Stepaniak, 2001: The atmospheric energy budget and implications for surface fluxes and ocean heat transports. Climate Dyn., 17, 259-276. Trenberth, K. E., D. P. Stepaniak, and J. M. Caron, 2000: The global monsoon as seen through the divergent atmospheric circulation. J. Climate, 13, 3969-3993. Trenberth, K. E., and C. J. Guillemot, 1998: Evaluation of the atmospheric moisture and hydrological cycle in the NCEP/NCAR reanalyses. Climate Dyn., 14, 213-231. Trenberth, K. E., and C. J. Guillemot, 1996: Evaluation of the Atmospheric Moisture and Hydrological Cycle in the NCEP Reanalyses. NCAR Technical Note NCAR/TN-430+STR, 308 pp. Trenberth, K. E., and C. J. Guillemot, 1995: Evaluation of the global atmospheric moisture budget as seen from analyses. J. Climate, 8, 2255-2272. Trenberth, K. E., J. W. Hurrell, and A. Solomon, 1995: Conservation of mass in three dimensions. J. Climate, 8, 692-708. Trenberth, K. E., and A. Solomon, 1994: The global heat balance: heat transports in the atmosphere and ocean. Climate Dyn., 10, 107-134. Trenberth, K. E., J. C. Berry, and L. E. Buja, 1993: Vertical Interpolation and Truncation of Model-Coordinate Data. NCAR Technical Note TN-396+STR, 54 pp. Trenberth, K. E., and A. Solomon, 1993: Implications of global atmospheric spatial spectra for processing and displaying data. J. Climate, 6, 531-545. Trenberth, K. E., 1992: Global Analyses from ECMWF and Atlas of 1000 to 10 mb Circulation Statistics. NCAR Technical Note TN-373+STR, 191 pp. ³ With the advent and availability of ERA-40 from ECMWF in 2003, our focus and publications will begin to incorporate budget products derived from this new 40 year reanalysis. My home page Last modified 3rd February 2006. CAS, the Climate Analysis Section in CGD at NCAR. This entire html file, and all its dependencies (including images), may be downloaded as a gzipped tar file (newbudgets.tar.gz) via email request.